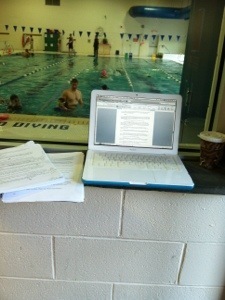 Swim class, editing, morning coffee, blogging. Hey, forty-five minutes is forty-five minutes. I take what I can get. Enjoy the minutes of your weekend! Just a typical day in the life of a mom, right? Totally! At today’s swim lesson I watched Netflix on my phone haha. Not much, just really jet lagged. How is you? Nice, rain rain rain here. I need to do some yoga. that’s my kind of multitasking! Love it!